Penn Jersey Roller Derby was thrilled to host a landmark in the history of the Roller Derby Coalition of Leagues (RDCL) —the first Battle on the Bank tournament on the East Coast. Adult and junior banked track leagues from all over the country met for the 9th time to show off their hard work and fought for a spot at the top of the rankings. It was a three-day whirlwind and it was nearly impossible to remember all the action. In case you blinked, here’s how it all went down at Battle on the Bank IX. Games on the first two days were only 30 minutes long with two 15-minute halves, except for the full-length Men’s Exhibition game. Sunday’s placement games were all full length. In Game 1, the newcomers to the banked track, Deadly Rival Roller Derby, took on the returning repeat champions, the L.A. Derby Dolls. Deadly Rival was not new to derby the broader sense however, attracting many former and current WFTDA players, but having less than a year to get, build, and practice banked track derby left the St. Pete team at a strategic disadvantage. Deadly Rival had trouble getting their jammers through LADD’s flat, three-person wall, as well as their keen, sweeping offense. The Ri-Ettes held them scoreless by halftime, but Deadly Rival managed to score 9 points in the second half with the help of a few power jams. Game 2 brought South Side Roller Derby from Houston, Texas, up against last year’s 4th place team, the Arizona Derby Dames. This game also had a lopsided halftime score with South Side at zero points to Arizona’s 89. Arizona controlled the pack, keeping it fast and fluid a majority of the time. Their walls frequently broke apart to work individually, but for them it worked amazingly well. South Side also got on the board with a power jam and effective goating of an AZDD blocker. This was anticipated to be the most evenly matched game of the first four since Tilted Thunder placed 3rd the year before, and Penn Jersey has been bettering its ranking each year. The score stayed neck-in-neck until power jams let the lead flip back and forth from the Rail Birds to the She Devils and back again. Strong defense came from Penn Jersey but stronger offense helped Tilted Thunder take control of the game, bringing it to 57-21 at the half. At nearly a 40-point deficit with five minutes left in the game, something clicked with Penn Jersey and they fought to close the gap, but came up short by 15 points by the final whistle. Tilted Thunder vs Penn Jersey. Photo credit: Juan Paden. 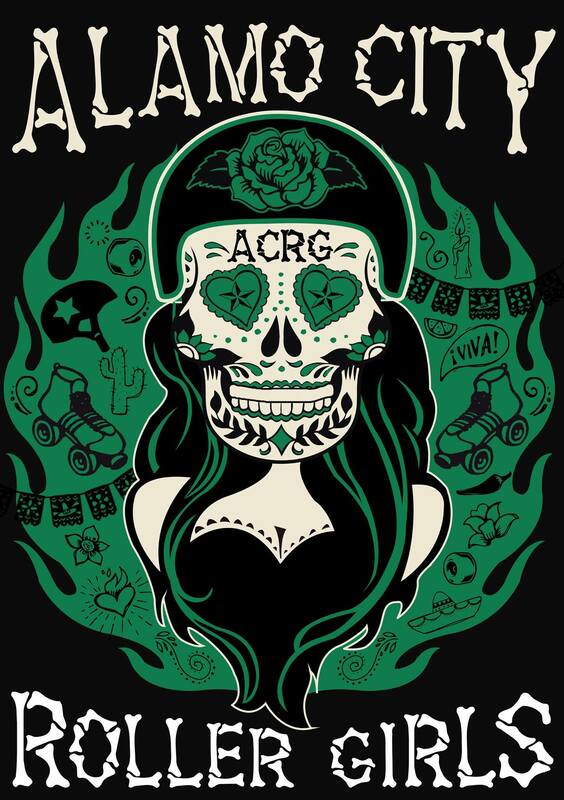 The last of the initial adult bracket games brought together San Diego Derby Dolls, who placed 2nd at last year’s BOTB, and the Texas Roller Derby All-Scar Army. SDDD pulled away early in the first half with excellent defense and recycling, which left TXRD to chase after them to bring the palindrome halftime score to 61 to 16. On occasion, Texas effectively sprung their jammer by spreading out then regrouping in the front with quick offensive hits, but in the end TXRD’s individualistic defense was no match for SDDD’s tight teamwork. In the first game of the losers’ bracket, Deadly Rival was able to score first with the assistance of an early power jam. Then South Side repeatedly got their jammer out first and was able to pick up a handful of points each time. Deadly Rival showed strategic growth in the second half, but SSRD’s skill, game awareness, and frequent power jams gave them a substantial lead until the final whistle, eliminating DRRD from the competition. Texas took an early lead in the second losers’ bracket game, easily getting their jammers out first as the shaken She Devils seemed flustered, but then Penn Jersey tightened their defense. The jammers for the host league played a tight game, calling off jams mid-scoring pass to prevent opposing points, which put them at a 30-point advantage by the half, 49-19. The second half started similarly to the first, but skaters from Texas started reaching penalty limits and by the game’s end, Penn Jersey eliminated Texas 95-35. The men’s full-length exhibition game brought Penn Jersey’s men’s team, the Philadelphia Hooligans, up against a motley crew of MADE and MRDA skaters from all over the tri-state area. It included skaters from the South Jersey Deviants, Jersey Boys, Your Mom, Harm City Havoc, and the New York Shock Exchange to form the Banked Track Bullies, who were gathered together by all-star jammer Rollomite. The Hooligans had a game awareness advantage over the Bullies as the entire Penn Jersey league practices and scrimmages together using both the RDCL banked-track and MRDA flat-track rulesets. The first quarter showed an evenly matched game with key jammers on both sides picking up points to maintain a tight score, until a power jam for the Hooligans helped them scoop up 22 points. From there, they began to use their banked track know-how to slow and stall Bullies’ jammers in the back of the pack, keeping it slow enough for their own jammers to make full scoring passes. During the second quarter, the Bullies started to pick up steam and congeal as they kept PJRD jammers in longer and got theirs out first for points, but the Hooligans soon countered. By halftime, the 30-point gap had closed and reopened as the Hooligans profited on key power jams. Initially, the bench for the Bullies looked a bit scarce, but as the game progressed and skaters who were stuck in traffic filtered in (and were okay-ed to skate), their roster filled out and perhaps caused a disjointed team that had already been learning to skate together on the fly. This allowed the Hooligans to pull away with a 59-point lead by using a similar defense to their female counterpart and were able to hold a substantial lead throughout the final quarter. Despite spectacular jamming performances by the Bullies, they just couldn’t catch up and the final score went to the Hooligans 217-147. The Junior bracket started on Saturday, also with shortened halves, and the Tilted Thunder Peeps took on the San Diego Dollinquents in the first ever junior derby game played on the Penn Jersey Roller Derby track. Despite the 9am first whistle, the stands were packed with skaters and fans cheering the juniors on. It would be a mistake to underestimate the junior teams due to their size or age, as many of these skaters have been skating for several years and the game play was some of the most intense seen all weekend with no holds barred blocking and skillful, strategic jamming. At different points of the game, both teams had their jammer take a hard block and sail through the rails of the track to the concrete below. In true warrior fashion, the jammers were able to dust themselves off, hop back onto the track, and go on to score points for their team. The Peeps went on to beat the Dollinquents by just 24 points, and clinched the first win in the Juniors bracket. The first game of the day in the adult bracket saw the L.A. Ri-Ettes take on the Arizona Hot Shots in Game 7, both teams coming off of a win from Day 1 of the tournament. Despite a strong offensive showing from the Hot Shots, the Ri-Ettes took their second win of the tournament with 106 points to Arizona’s 37 points, sending the Hot Shots to play Penn Jersey later on in the day. The San Diego Wildfires started this game off strong with their powerful jammers cutting through the pack with agility and speed while their blockers kept the Tilted Thunder pack separated and their jammer contained. When Tilted Thunder’s jammers did break through however, they did an excellent job of hustling back around to the pack, but San Diego’s wall of blockers prevented them from getting points on the board. At the break, Tilted Thunder put up 19 to San Diego’s 66 points and the Rail Birds only managed to score 5 more points in the second half. With their second win, San Diego moved on in the bracket to play L.A. in Game 11. Game 2 in the juniors’ bracket saw the Arizona Minor Assaults go head to head with the Tilted Thunder Peeps, and ultimately the Peeps came out on top in a nail-biting win 74-68. That secured them a place in the Junior bracket championship game. Peeps vs Minor Assaults. Photo credit: Juan Paden. During the first 15 minutes of Game 9, the Tilted Thunder jammers slowly but surely worked up the lead advantage over South Side, picking up a few points every jam while their blockers kept South Side’s scoring to a minimum. South Side’s jammers were fast and agile when they broke out of the pack, but Tilted Thunder’s blockers mostly kept them to a single scoring pass. Just before halftime, a full South Side penalty box allowed Tilted Thunder to capitalize on multiple scoring passes, giving them a 50-point lead, 77-23. The second half of the game saw skaters on both teams spread out as blockers delivered some seriously hard hits, and that allowed jammers from both teams to score. South Side picked up an additional 39 points to outscore Tilted Thunder by one point in the second half, but Tilted Thunder took home the win 115 to 62. Arizona’s hard-hitting offensive maneuvers left Penn Jersey distracted, which allowed the Hot Shots to take a solid lead early in the first half. For awhile the She Devils had just 1 point on the board as they struggled to get their jammers out of the pack, meanwhile the Arizona jammers swept through for multiple scoring passes. Finally, the She Devils were able to get a grand slam and put 10 more points on the board, totaling 11 to the Hot Shots’ 60 points. The first half ended with the Hot Shots ahead, 93 to 18, but the She Devils came back to adapt to the Hot Shots’ offense while maintaining their own defensive walls and preventing Arizona from getting multiple scoring passes. The She Devils were able to put 33 more points on the board and outscored the Hot Shots in the second half, but Arizona’s strong first half took them to victory by 71 points. Game 3 determined who would follow the Peeps to the championship, and the hard-hitting action between the Arizona Minor Assaults and the San Diego Dollinquents did not disappoint. The Minor Assaults came out with the win, beating the Dollinquents 92 to 67, which pitted them against the Peeps in the Junior bracket championship the next day. This was one of the closest games of the tournament, and with only a 19-point spread by the end, it could have been anyone’s game. The Ri-Ettes showed off their jammers’ speed, agility, and tactical control by calling off the jam before the Wildfires could score, which helped them maintain an early lead. San Diego’s blockers moved like a well-oiled machine, staying together, and playing offense as a unit to create holes for their agile jammers to maneuver. At the half L.A. led 53-17 but a San Diego star pass early in the second half, coupled with a full L.A. penalty box, allowed the Wildfires to gain momentum and pick up some much needed points. The energy in the Warehouse was palpable as The Wildfires encroached on the Ri-Ettes, and the crowd cheered and called for another jam when the refs called a penalty jam for the last jam of the game. The Ri-Ettes won 86-67, but if there had been another 2 quarters of game play, it could have played out much differently. In the final game on Day 2 of Battle on the Bank, Arizona’s jammer came out swinging as she juked her way through the pack to pick up 9 points in the first jam. Arizona’s heavy offensive blocking continued to control Tilted Thunder, and by halftime the Hotshots had a solid lead 50-8. The second half saw Tilted Thunder amp up the intensity to get some points on the board, slowly adding them jam by jam. Unfortunately it was too late, as Arizona’s ability to achieve multiple scoring passes throughout the second half cemented their lead, and the Hot Shots moved forward to compete the next morning against San Diego. Arizona vs Tilted Thunder. Photo credit: Juan Paden. San Diego started strong off the first whistle and kept the Arizona jammer in the pack the entire jam while their own came through for two scoring passes. However, in the following handful of jams, the roles reversed and the AZDD jammer sliced through on a scoring pass before the SDDD jammer could break and reach the back of the pack. The tables turned once more with a power jam in San Diego’s favor. They were able to catch a goat, who didn’t seem to mind being stuck behind a four wall, and their jammer was able to glide through the slow-moving pack with ease to pick up 14 points. San Diego played smart while it seemed like Arizona tried to keep it safe. However, AZDD may have called off a few key jams prematurely, picking up only one or two points before calling it, even without an SDDD jammer close behind. Arizona’s hard hits certainly did some damage and sent an opposing blocker off the track in turn one at one point, but she hopped right back on and got back to her wall. By halftime the score had hit 91 SDDD against AZDD’s 45. The second half continued with Arizona’s formation of staggered walls, which allowed for their blockers to make freight-train hits that sent the opposing skaters into the infield, but the San Diego jammers deftly juked through the holes left by this style of play. However, Arizona’s strategy made for good offensive blocking which kept the tight SDDD walls from forming. When they were able to get together and cover the track, San Diego controlled the pack and kept jammers back more effectively than their opponents. By the fourth quarter, it looked as if Arizona’s jammers ran out of steam and occasionally couldn’t find the oomph to break out of the pack. The final score went to San Diego 171, Arizona 102, leaving the Hot Shots with 3rd place. The Juniors championship found the Tilted Thunder Peeps up against the Arizona Minor Assaults again. Their prior match ended extremely close with a final score in Seattle’s favor 74-68. TTRP pulled away early with AZMA hot on their heels and from jam to jam, the dominant team took the lead, showing how extremely evenly matched the teams were. In the second quarter, Arizona took a strong back wall and began to hold onto jammers while their own made multiple scoring passes, once again closing the score gap. The Peeps opted to maintain the front of the pack from the start, but these two strategies caused multiple split packs to neither advantage and resulted in several Failure to Reform penalties. The Minor Assaults persisted until another lead change brought the score to 90-71, Arizona. As the second half got under way, the Peeps were able to take back the lead by working in a two-wall up front to provide offensive for their jammer, and a two-wall in the back to hold in Arizona. Pack dominance continued to switch hands and Arizona fought hard to close the gap that the Peeps had opened in the third quarter. The Arizona jammer began to repeatedyl break first as her blockers held in the Peeps’ point scorer, but TTRP adjusted and maintained a solid lead and in the last five minutes they pulled away even further. The Tilted Thunder Peeps took 1st place in the Junior bracket with a score of 190 to Arizona Minor Assaults 108. The hour-long championship game came down to a So-Cal showdown, which was their second matchup of the weekend. The first few minutes of game play started out slow, with each team picking up 1 or 2 points over the other, and then began to gain momentum. The Wildfires started out strong, taking the lead over the Ri-Ettes for the majority of the first quarter and Wildfire jammer, Slamurai, picked up 9 points in one jam. With 3 minutes remaining in the quarter, the Ri-Ettes racked up 19 points in a single jam which put them ahead of San Diego 49-21. San Diego pushed back with strong defense and held the L.A. jammer to 10 points in the next jam. The period ended with L.A. ahead by 30 points, 61-31. The next quarter saw both teams switching gears to a more defensive game and in the first five minutes, L.A. only scored 7 points to San Diego’s 5. With six minutes remaining in the half, L.A. picked up 15 points in a power jam which brought their lead to 90-44. The Ri-Ettes continued to pick up multiple scoring passes while containing the San Diego jammer’s opportunities, and called off the jam before the Wildfires’ jammer could return for points. The first half of the game came to a close with LA Ri-Ettes in the lead 117-47. L.A. Ri-Ettes vs San Diego Wildfires. Photo credit: Juan Paden. The third quarter was much like the second with both teams starting off very defensively at first, but then L.A. went on to score 30 points to San Diego’s 6. The Ri-Ettes played very strategically, making sure their jammer was out by the first turn of the track to maximize the time allotted to score points, and also smartly calling off the jam before their opponents could put points on the board. The third quarter ended with the Ri-Ettes maintaining a solid lead over the Wildfires, 170 to 75. The fourth and final 15 minutes of the game saw yet another return to defense for both teams, as both focused on walls and containing their opponents’ skaters. A 100-point lead seemed staggering at this point, but with the skill of San Diego’s skaters it would not have been unreasonable to imagine them pulling out a comeback. However, the number of L.A.’s multi-pass scoring jams and strategic call-offs were not in San Diego’s favor, and L.A. continued to pull ahead. The final score of the 2016 championship game went to the Ri-Ettes, with 210 points to San Diego’s 106 points. This was the 5th consecutive year that the L.A. Ri-Ettes had taken home the 1st place trophy. Deadly Rival vs South Side. Photo credit: Juan Paden. For more game detail head over to the original recap posting on Penn Jersey’s blog which was written by Ruby Bruiseday & Beatrix R. Forkids. The post Battle on the Bank IX Recap appeared first on Derby Central.